The premise of this book is great. Marina, a teenage ballerina, and her father are forced to flee the Soviet Union in the 80s, shortly after Brezhnev’s death. Marina’s mother, who is also a famous ballerina, has been taken away by the Soviet government, and the story is about Marina’s life in New York. The possibility of being caught by the KGB looms over her. 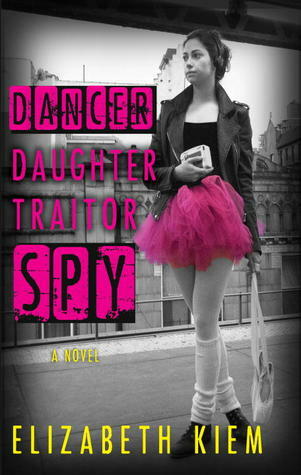 She wants to continue her dancing at Juilliard, but she doesn’t know who to trust. What if her dance partner is a spy? The elements of espionage, action, and danger are what made me pick up the book. It seemed so exciting! It was also cool that it was set during the Cold War. Unfortunately, it fell short of my expectations. The main problem with the book is that not much happened. I was halfway through and it still felt like the author was setting up the story. Thing is, the book is only about 280 pages, so there isn’t enough time or space to spend so long on exposition. As a result, even though it’s written pretty well, the story doesn’t really go anywhere. There isn’t any fast-paced action; it’s mostly Marina’s thoughts and dialogue about what could happen. Marina and her mother also have a “sixth sense” which isn’t really explained well or developed. It was confusing to read at times because I wasn’t sure if something was actually happening or if it was just a vision. The idea of having visions also didn’t sit well with me. I don’t know if the author was going for magical realism here, but being able to see the past or the future seemed jarring in a book that otherwise adhered so much to reality. As for the good stuff? Well, I loved the details about Russian culture woven into the story, and I also loved the references to music. Most of the chapters were song titles or had something to do with music, and I liked how Marina used these songs to tell her own story. As I mentioned before, the story is also written pretty well (the problem was with plot, not writing). Overall though, I was disappointed with the book. It just wasn’t what I was looking for. I didn’t care enough about the characters to get into it as much as I wanted to. It seems that the author had some excellent ideas, but they weren’t executed as well as they could have been. This book probably wouldn’t be at the top of my list of recommended titles, but I do realize that it is the author’s first novel. I would definitely be interested to know what she writes about next.